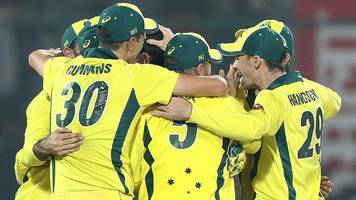 India quest to find the right combination for the upcoming World Cup ended with a 35–run defeat in the decisive fifth ODI against Australia as they lost the series 2-3, in New Delhi. In what was their last game before the showpiece event in United Kingdom, the Indian innings finished on a disappointing 237 after Australia had put on board 272 for nine, built around Usman Khawaja fine century. It was India's first ODI series defeat at home since losing to South Africa in 2015 as their big guns fell silent on the day when the series was on line. India also became the only side in the world to lose an ODI series twice after leading 2-0. Opener Khawaja continued his good form, as he stroked 100 -- his second century of the series -- before India's bowlers did well in the middle overs to restrict the visitors to 272 for nine. But India struggled with the bat, with only Rohit Sharma (56) going past the 50-run mark, as they finished on a disappointing 237 all out.